An inspiring example of a community coming together. Jonathan Moran, the 12-year-old boy who made headlines last week after being bullied over his sneakers, isn't going to have any footwear needs for a while. The firefighters and EMTs who responded to the call of Jonathan getting beat up on the bus helped him out by getting him a new pair of Nike LeBron sneakers, in turn inspiring others to pull together and send him some shoes. It started with Devlin Braswell, who read about Jonathan here on Sole Collector. Braswell is an honor roll student at the Fashion Institute of Design & Merchandising in San Francisco who also runs his own custom sneaker business, FBCC. He posted his initial reaction on Instagram, saying that he was touched by the story and that he was planning to put together a sneaker care package for Jonathan. Commenters responded with eagerness, many of them saying they planned to do the same. Braswell thinks that as the number of people interested in sneakers grows, it naturally attracts more negativity. "I just hate to see kids getting bullied," Braswell explains. "It's getting out of control with 'What are those?!' and stuff like that...the more popular the shoe culture is getting, the more you get these newbies, shoe collectors or whatever. Then they make other people feel like less of a human because they don't have the latest KDs or Jordans or whatever. I just think that's a disgusting thing that's going on." Jonathan is autistic and has had trouble with bullies in the past, which also struck a chord with Braswell, who says he had a daughter with autism who passed away at just 11 months old. 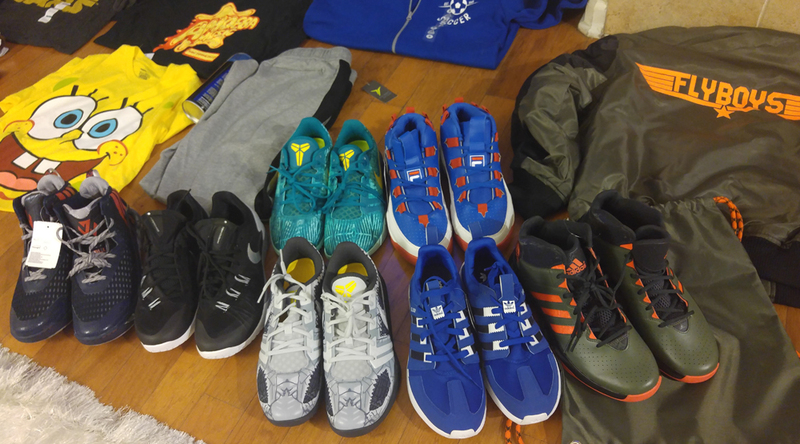 Shown above are some of the shoes and other gifts Braswell sent off. There are size 10s that Jonathan can wear now, along with bigger pairs he can grow into. Braswell also tossed in some items to satisfy Jonathan's apparent love of SpongeBob and Star Wars. He says he's even working on a special SpongeBob-themed custom sneaker as a Christmas present for Jonathan. The sneaker gift box from Braswell is still in transit but Jonathan's mother, Hope Moran, is already expressing gratitude for this random act of kindness. "It's been amazing," she says. "I think Jonathan's going to have shoes for the rest of his life...I can't imagine his face when he sees this box of sneakers."